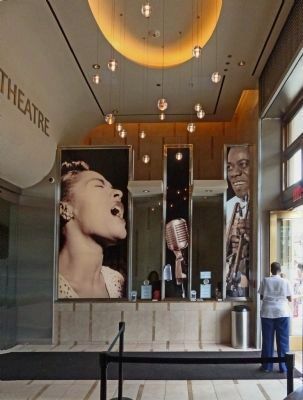 As the neighborhood went, so did the Howard. Although the theater escaped damage in the riots of April 1968, audiences thereafter avoided the riot-scarred neighborhood. The Howard closed in 1970, reopened in 1974, and closed again. 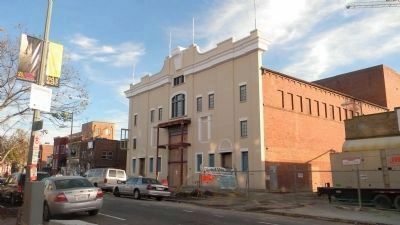 Rehabilitation started in 2010.
for performers bound for U Street night spots or an after-show soiree at Cecilia’s. This area’s bakeries included two others near Howard University: Corby (later Continental) and Bond Bread. Baseball fans leaving Griffith Stadium remember stopping for fresh doughnuts on the way home. 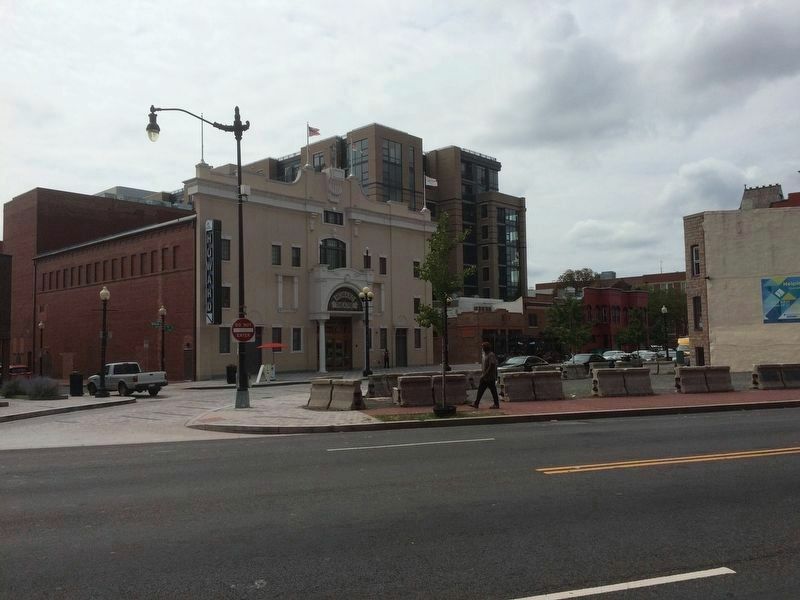 Near the Howard Theatre at 614 S Street was Jean Clore’s Guest House and after-hours club. “Well-known dignitaries from every walk of life” stayed at Clore’s “swanky homey hotel,” according to the Black press of the 1930s. In 1982 the New Community Church moved into the building. Howard Theatre manager Shep Allen with Fats Waller at the Howard, 1939, as Waller presents a check to a Police Boys Club representative. Cecelia Penny Scott, right, with husband James Scott, right rear, and patrons in her popular restaurant and rooming house across T Street from this sign, 1958. Location. 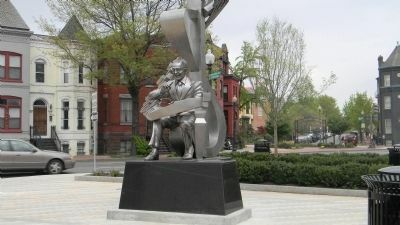 38° 54.937′ N, 77° 1.265′ W. Marker is in Shaw, District of Columbia, in Washington. Marker is on T Street Northwest east of 7th Street Northwest (U.S. 29), on the left when traveling east. Touch for map. Marker is in this post office area: Washington DC 20001, United States of America. Touch for directions. 4. 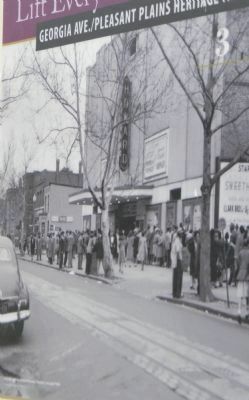 "Crowds gather at the Howard Theatre, around 1940"
- close up of photo by Robert H. McNeil on reverse side of marker. 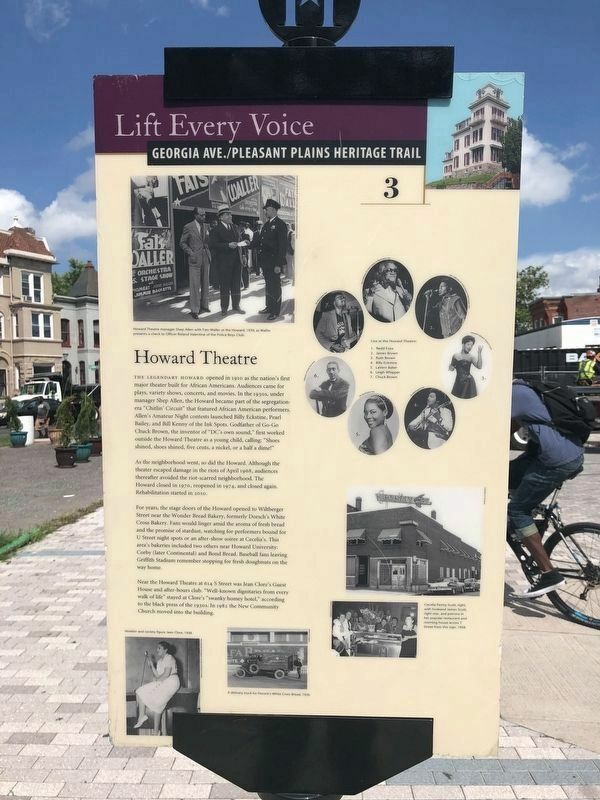 (about 300 feet away, measured in a direct line); a different marker also named The Howard Theatre Walk of Fame (about 300 feet away); The Doctor Is In (about 500 feet away); Grief Turns to Anger (about 500 feet away). Touch for a list and map of all markers in Shaw. 6. 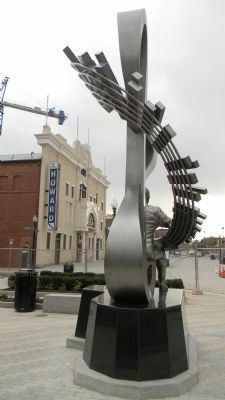 The Howard Theatre - viewed from the new Duke Ellington memorial at T St. and Florida Ave.
newly constructed, east of the Howard Theatre Marker. 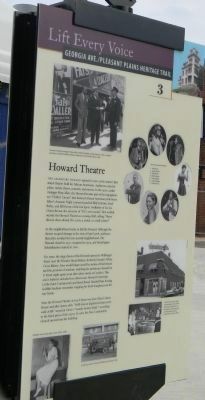 The marker is unfortunately no longer in its previous location, potentially due to temporary construction as seen here by the Jersey barriers in front of the Howard Theatre. 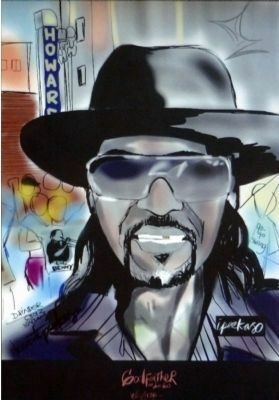 This portrait of Chuck Brown by Peekaso hangs in the lobby of the Howard Theatre. 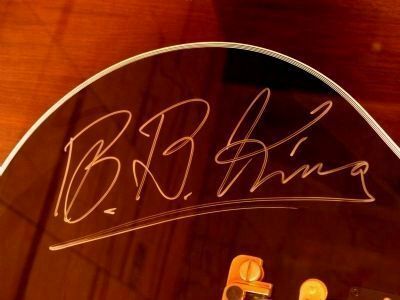 The blues legend's autograph on a guitar on display in the lobby of the Howard Theatre. 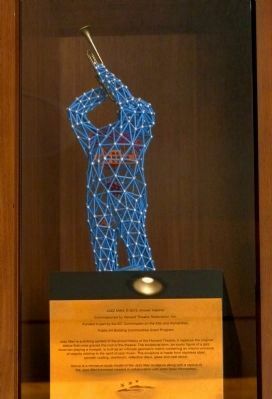 This model of Brower Hatcher's sculpture can be seen in the lobby of the Howard Theatre. 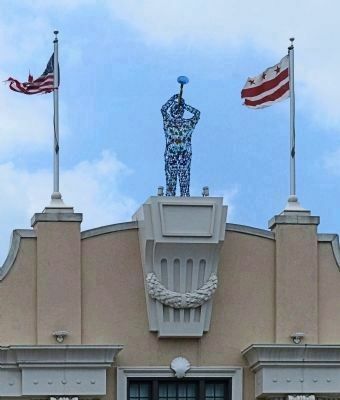 Brower Hatcher's Sculpture atop the Howard Theatre. More. 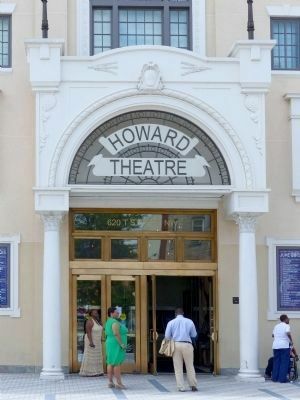 Search the internet for Howard Theatre. Credits. This page was last revised on March 18, 2019. 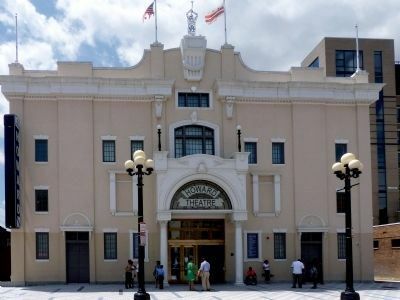 This page originally submitted on March 24, 2012, by Richard E. Miller of Oxon Hill, Maryland. This page has been viewed 785 times since then and 17 times this year. Last updated on March 7, 2019, by Devry Becker Jones of Washington, District of Columbia. Photos: 1. submitted on August 1, 2018, by Devry Becker Jones of Washington, District of Columbia. 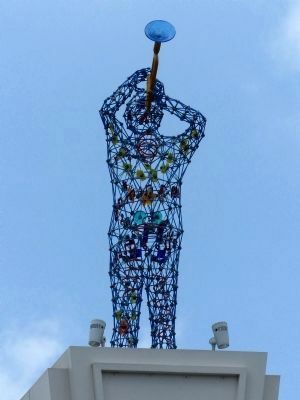 2. submitted on March 24, 2012, by Richard E. Miller of Oxon Hill, Maryland. 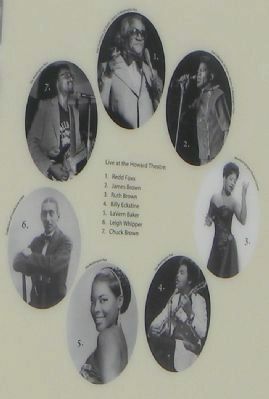 3, 4, 5, 6, 7. submitted on March 31, 2012, by Richard E. Miller of Oxon Hill, Maryland. 8. submitted on September 19, 2016, by J. Makali Bruton of Querétaro, Mexico. 9, 10, 11, 12, 13, 14, 15, 16. submitted on June 28, 2015, by Allen C. Browne of Silver Spring, Maryland. • Bill Pfingsten was the editor who published this page.